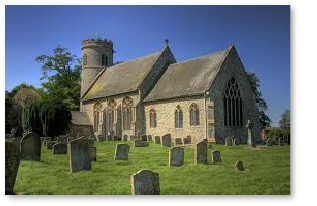 St Mary's church is located on the outskirts of the village of Weeting on Home Farm Lane. The easiest way to find us is to follow English Heritage signs for Weeting Castle. The Church is usually open every weekend during the morning. Sunday's at 9.15am we usually come together for a service. Once a month we also have an All Age Eucharist. See our worship section for further details. ﻿Worship: Services are taken from the Church of England's Common Worship Order One in modern language. On Sunday's we usually celebrate the Eucharist together. Hymns are usually accompanied by the organ. The service is usually said throughout, unless it is a Benefice occasion when the Gloria, Sanctus & Benedictus and Agnus Dei may be sung. Churchmanship is central to modern catholic with the Priests wearing Eucharistic vestments and being assisted by a server. Church attendance averages out at about 10-15 each Sunday but many more attend on the great festivals, the congregation more than doubling at Easter and Christmas services and on Remembrance Day. Music: There is a regular organist for the hymns, though a CD player is used when the organist is unable to attend. Hymns are taken from ‘Complete Anglican Hymns Old and New’. Bells: The tower contains two bells, which are hung for chiming rather than change ringing. They are rung most Sundays and for special services by a dedicated ringer. A tower bell is also rung at the elevations during the Eucharist prayer in communion services. History: St Mary the Virgin Church, with its round tower containing two bells, is adjacent to the ruined 12th century Weeting Castle and stands on the north eastern edge of the village facing open agricultural land. Its origins are 11th or 12th century, with some 14th century work but the whole building received a total renovation in the 19th century by John Angerstein, the owner of Weeting Hall. The Hall was demolished in the 1950s. To the visitor, the first impression might be that this is an example of a Victorian Church, however this is not borne out by closer inspection. The part of the building which looks to be mediaeval is the Chancel with its five light east window and its two light south window plus a similar one blocked up on the north side, all of the Decorated period. These windows are of reticulated tracery though the head of the east window is broken by an octofoiled circle. There are internal niches to the North and South of the East window. The North nave arcade is of four bays with piers with four principal and four secondary shafts. In the South side of the nave the windows are of the Perpendicular period and have stepped embattled transoms. The roofs are Victorian as are most of the fixtures and fittings. However there are some fifteenth century benchends as well as two double Piscinas, one pair in the Chancel and the other pair in the Lady Chapel, to the north of the east window. Of particular interest is the large East window, installed in 1900 by Mr. George Parlby on the instructions of Mrs. Hall, the last owner of Weeting Hall. The window was completely renovated by the descendants of Mrs. Hall and rededicated by Anthony, Bishop of Ely on 23rd April 2005. The font is of a very early date, octagonal and perfectly plain, standing on an octagonal plinth and it is believed that the font was recovered from a disused Church, located in the nearby battle training ground. A large family vault containing seven members of the Angerstein family is located within the Church. Fabric - the last Quinquennial Inspection was completed in 2014 and the fabric is in a generally reasonable state of repair, work to the floor, the outbuildings and the roofs having been carried out in the past few years. There exists a document in St. Mary’s Church that would suggest that at one time there was in the South window of the Church a portrait of Sir John Howard knight, made at the time when he was married to his first wife Margaret, daughter and heir of Sir John Plays knight which Margaret died in the year of King Richard the Second. At one time there existed in the North window (probably above the Priest’s Door) the original of the picture below which shows the kneeling figure of Sir John Plays, wearing his coat of armour.